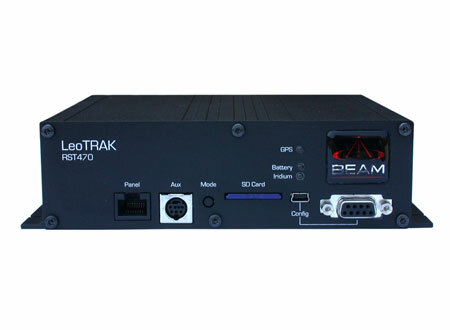 Beam LeoTRAK RST470 provides the latest technology to support GLOBAL alert, monitoring and tracking applications over the Iridium satellite network. The LeoTRAK RST470 has an inbuilt Iridium 9601 Short Burst Data module along with a Super Sense GPS engine providing pinpoint accuracy for Tracking & Alert applications worldwide. LeoTRAK RST470 terminal can send tracking & alert messages on demand &/or stored on the local SD card for future retrieval, the system also supports the option of inbuilt battery backup or the use of a compact control panel for simple messaging applications. An advanced LeoTRAK Management System (LMS) enables the unit to be highly configurable to support a wide variety of applications monitoring and controlling internal and external events.